I recently was lucky to come across a fern leaf grevilla with four honey bees gathering pollen from it. 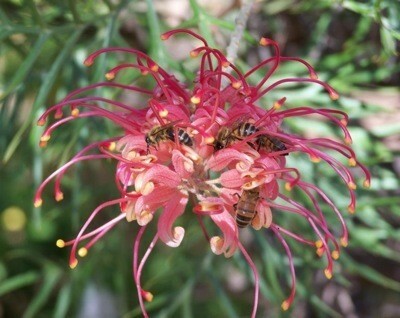 I feel the red of the grevillia flower really accented the bees colours. The photo was taken mid morning at Corrigin, Western Australia. Those are not honey bees, they're hornets. No, they are bees. Our hornets have a lot longer body than the bees. They look huge on the flower as I zoomed right in to get them.